Many folks love growing lettuce in their garden. 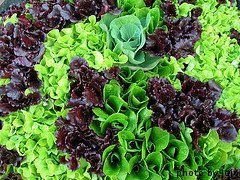 There are lots of different lettuce varieties available to add new textures and tastes to any garden salad. Lettuce can be sweet or peppery or somewhere in the middle. It comes in several different forms including leaf, bibb, romaine and crisphead lettuce. Nothing tastes better than a fresh salad made from lettuce you picked only minutes earlier. It's possible to get 2-3 lettuce crops per year, depending on your climate and the variety of lettuce you grow. Looseleaf lettuce and Bibb lettuce usually mature in about 50 days, although some varieties are ready for harvest as early as 25 days. Romaine and crisphead varieties mature in about 80 days. If you grow different varieties and stagger the plantings, your garden can produce a constant supply of fresh greens throughout the growing season. Lettuce is a cool-season crop and its seeds usually won't germinate when soil temperatures reach above 80 degrees F. Plant normal lettuce varieties in the spring and fall. Try growing heat-resistant varieties in the summertime if your climate permits. 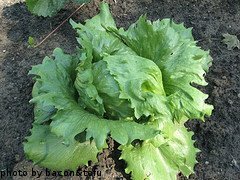 In most cases, leaf lettuce varieties are more forgiving of the heat, followed by bibb lettuce, romaine and then crisphead varieties, who don't have much heat tolerance at all. During the hot months of summer, lettuce typically does better in partial shade. Some folks grow lettuce between rows of taller crops like peppers, tomatoes or broccoli. Lettuce also requires a steady supply of water, especially during hot weather. If you think about, lettuce leaves have a high water content, so keeping the roots moist is essential to good lettuce production. In addition, keeping the soil moist also cools it off a bit, which helps lettuce plants grow better. Lettuce seeds can be started in a containers and then transplanted later or the seeds can be sown directly in the garden. Lettuce doesn't take up much space and can easily be grown in containers. When most folks think of eating lettuce, they usually think of salad. And while that's the way it's most often eaten, you can also use lettuce leaves as wrappers.